There are a growing number of people leaving behind the traditional life on a quiet street. Adventure is such an important part of life, and campervans are a luxurious way to live and travel. With the culture growing, there are more and more ways to turn an old van into a comfortable, mobile living space. We want to help weed out the repetitive tips and share some helpful resources that can make a DIY campervan project go smoothly. Finding the Right Van and More! There are a variety of makes and models of vans on the market. Some are very old, but affordable and allow for more creativity. Others are new, have a lot more bells and whistles without the extra work and expense. Those over at The Vanual have laid out a list of different types of vans with their pros and cons. Picking out a van to convert is the most important decision you’ll make when creating your dream van life. The Vanual is also a great resource as a step by step guide for transforming your van, including a comprehensive list of tools and materials that you’ll need. The way your van is constructed must fit the way your days flow within. Some people just want a comfy campervan mattress to sleep on, while others may need a solid cooking space. It is mostly about your own lifestyle and how you can miniaturize it to fit into a van. Two Wandering Soles offer great tips and tricks on planning the layout and actually using it after the conversion. A step-by-step written instruction for your conversion is a great, but sometimes it helps to have a video to bring a project to reality. These three videos will help create a visual of the actual process of creating a campervan. It’s not always fun and games! Nate has a great 30-minute van conversion video (he did it in 17days! ), and make sure you check out the The Wandering Wagners’s video as well. Additionally, Jaz Morton has a whole van conversion video series with complementary blog posts. 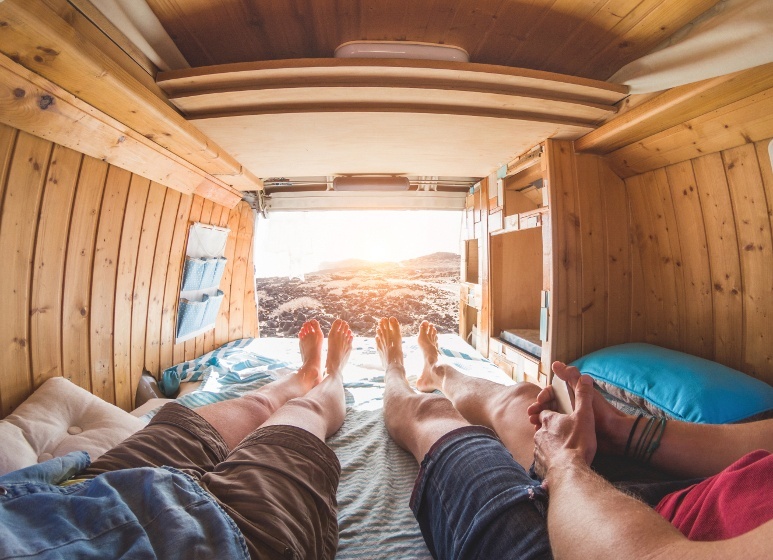 You might have noticed at this point that showers and toilets aren’t included in most converted campervans., and the reason is that the plumbing is rather complicated, and it will inflate your budget. Picking out how exactly you are going to fit a toilet and shower in a small space is only the first problem to tackle. You also have to figure out how to get the water to those said appliances and where to store the water in the first place, which can be a challenge especially if you intend to travel/live in colder areas where below 32°F is common. Here’s a great blog post in this direction about the very predicament in his own campervan conversion. Once the van is in place, the plans are complete, and the base is finished, it is time to customize! There are many different ways to decorate the interior of your van, but make sure you are using the space as efficiently as possible. You want your van to be personal and functional. Check out Camplify for some mesmarizing interior decorating ideas. However your van turns out, remember that it should be a reflection of you and your lifestyle. And don’t forget that we have campervan mattresses that can fit your new travel life. We even do custom sizes! Happy travels!